That Pathfinder has a reputation for being one of the most mobile Apex Legends characters may flummox you – but prefer to be unflummoxed, because it’s all completely true. Pathfinder’s abilities, particularly his Grappling Hook, are extremely mobility- and momentum-focused, and greatly reward players who look for unexpected angles and wide flanks during fights. As possibly the character with the highest skill ceiling in the game, it’s a no-brainer that we compile this Apex Legends Pathfinder guide, which will take you through each of his abilities one at a time and explain how and when you should be using them. All Apex Legends characters are fairly tricky to master, but Pathfinder takes this to a whole new level with his extremely nuanced Grappling Hook Tactical ability. Click on any of the links below to skip straight to a specific section and start learning how to become an expert rope-swinging murder machine. Pathfinder is all about mobility. This may surprise some of you who have given him a go once or twice, and noticed that he seems slower and clunkier than other Legends. Well, for one thing, all Legends move at exactly the same speed – they just appear different due to camera height and arm animation speeds; and for another, if you learn and properly utilise Pathfinder’s abilities, then you will end up ahead of your teammates the vast majority of the time. Key to Pathfinder’s success and popularity is his Grappling Hook, which gives you a unique and versatile form of mobility and travel on a short cooldown. There’s a great deal to learn in particular about using the Grappling Hook correctly, but once you’ve mastered it, there are few options better both for escaping and initiating fights. While his Passive leaves much to be desired, his Tactical and Ultimate both should be used as often as possible to take advantage of Pathfinder’s movement-based prowess. His main downfalls include a fairly bulky hitbox (even after the Season 1 patch) and the fact that you’ll often find yourself split off from your teammates (which is how Pathfinder should be played, but it can lead to issues where your teammates are unable to save you if you get into trouble). The only thing you can do to make up for these weaknesses is to emphasise mobility and quickness, using your abilities as much as humanly (robotly?) possible. Season 1 brought with it a variety of balance changes to different Legends, and Pathfinder was one of three to receive some decent buffs to his character and viability. His hitbox has been reduced to better fit his character model – a much needed change, although he is still a little beefy compared to the smallest Legends out there. He also received a very slight buff to his (still comparatively useless) Passive, which increased the number of Survey Beacons on the map to 12 from 10. Pathfinder’s hitbox leaves quite a bit to be desired, particularly when compared to the diminutive frame of Wraith or Lifeline. But his skillset allows you to stay on the move, offsetting the slight disadvantage received from his bulkier hitbox. Pathfinder, like every character in Apex Legends, has access to three abilities: a Passive (always in effect), a Tactical (activatable ability on short cooldown), and an Ultimate (powerful activatable ability which requires charging over time). While his Passive is fairly straightforward and honestly quite mediocre, his Tactical is one of the most useful (and by far the most fun) abilities in Apex Legends, and, combined with his Ultimate, can lead to some devastating repositions and flank attacks on enemy teams. Insider Knowledge 7s Scan a survey beacon to reveal the ring’s next location. 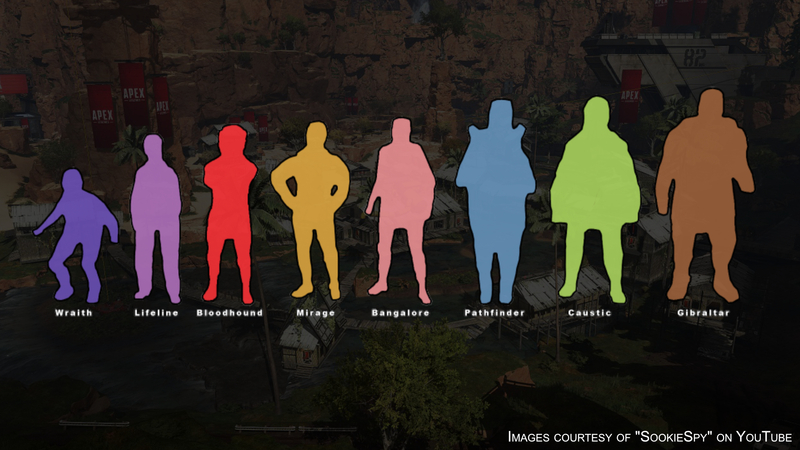 Insider Knowledge is the only ability in Apex Legends that can only be used in specific locations. These locations are known as Survey Beacons, and they appear in different locations throughout a match. Once you find one, as Pathfinder you can interact with it, which causes a progress bar to appear much as though you were reviving someone. After around 7 seconds, the scan is completed, and you and your teammates will be able to see on the map two circles: one white, which everyone can see; and one green, which shows you the next round’s Ring location. It’s the kind of ability where if you happen to find yourself near a Survey Beacon, sure, you might as well use it; but in the grand scheme of things it’s not exactly a great Passive ability, especially compared with the fantastic Passive abilities of characters like Bangalore or Wraith. But it’s good to understand, and gets more useful towards the end of the game, where getting into the next Ring before any other team becomes more of a priority. For more information on the Ring and the various Rounds that make up a match, be sure to check out our definitive Apex Legends Ring guide for in-depth explanations and stats. If the current Round is about to end, then wait for it to end and the next Ring to appear before scanning a Survey Beacon; otherwise you’ll have used it for nothing. Be aware of the time it takes to scan a Beacon. You’ll have to stand still for 7 seconds, so make sure you’re safe before you do so. Survey Beacons don’t always appear in the same places each match, so you can’t learn by heart where they all are as you can with Respawn Beacons. For all Respawn Beacon locations, check out our Apex Legends reviving guide. Insider Knowledge gives out a loud audio cue as you scan a Survey Beacon, which can be heard from some distance away. Grappling Hook 15s Grapple to get to out-of-reach places quickly. Probably the most complex and high-skill-ceiling ability in the entire game, Pathfinder’s Grappling Hook is the core around which Pathfinder’s overall style of play forms. It’s also widely misunderstood by newer players, so let’s get right into it: this is not Widowmaker’s Grapple from Overwatch. It doesn’t just move you in a straight line from your current position to the point you grapple to. You can use it to swing, to fling yourself high into the air, and to cover massive distances quickly. If you’ve played Titanfall, Pathfinder’s Grappling Hook will be much more familiar to you than players who started with Apex. The key is to wait until the grapple has connected, and then turn left or right around 60-90 degrees from the grapple point, and hold Forward (“W”) and strafe (“A”/”D”) away from the grapple point as you move. This will cause you to swing around the point, rather than simply being pulled towards it. Using this method, and combining it with a jump as you disconnect and a slide as you hit the ground, you gain a massive increase in momentum and speed, and after some practice you can use it to completely reposition during a fight and pull off a devastating flank on your unwitting opponents. There’s an awful lot to learn with this Tactical ability, so it’s very fortunate that it has the shortest cooldown of any activatable ability in Apex Legends. It is your modus operandi as Pathfinder to use this ability as often as possible, even during period of downtime, simply to practice for upcoming fights and to cover ground more quickly. You can use Grappling Hook on enemies, pulling yourself quickly towards them (or, if you move backwards as you do it, pulling them towards you!). If you want to swing, look to the left or right of where you grappled, and move and strafe away from the grapple point as it begins to pull you. Jump at the end of a grapple (as the rope disconnects) to conserve your momentum and cover more ground. Always look for unexpected angles/flank attacks during a fight. You will not trigger the ability cooldown if you do not attach to anything. There is an exploit which allows you to climb indefinitely up smooth vertical walls, by moving right up to the wall, facing straight up, climbing, and spamming Grappling Hook (so that it doesn’t connect with anything). There is a short cooldown on Grappling Hook, so don’t be afraid to use it whenever you can. To cover the most ground in the shortest space of time, you should aim to use the Grappling Hook at its maximum range. Big Grappling Hook plays may often result in you falling from great distances, which, while it doesn’t damage you, will result in a second or so of fall stun time where you cannot move after landing. To avoid this, melee right as you hit the ground, and you won’t suffer the stun. There is a small flash at the grapple point when it connects, which shows you when you should aim to the side and start moving if you want to swing. Turning more than 90 degrees away from the grapple point will often break the grapple immediately, so stick to 60-90 degrees. Zipline Gun 1m 30s Create a zipline for everyone to use. Pathfinder’s Ultimate is not the most powerful of Ultimate abilities, but it can still provide some much-needed mobility either for yourself or for your team as a whole. Selecting it will give you the ability to aim and fire your Zipline Gun across great distances, which, as long as it connects with the terrain or a building at the end, will erect a Zipline (just like those found naturally across King’s Canyon) between your current position and your target destination. It’s important to note that these Pathfinder-created Ziplines will persist until the end of the match, and enemies can use them as well, so you should always be wary when hanging around at the end of the Zipline after using it. Regardless, this is a useful ability for covering ground quickly, particularly for circumstances such as escaping from a closing Ring. However, it’s outmatched in nearly every way by Wraith’s Ultimate ability, and the chances to use Pathfinder’s Ultimate for a team play are few and far between. Just like with the Grappling Gun, you should concentrate on evaluating your surroundings and using your Zipline Gun to reposition yourself for flanks and unexpected angles during encounters with enemy players. Your Ziplines will persist for the rest of the match, and can be used by anyone, whether they be friend or foe. The animation for firing and erecting the Zipline may trick you into thinking it’s ready before it is, causing you to accidentally cancel it. Wait for the Interact prompt on the Zipline before you attempt to use it. Firing the Zipline Gun does have an associated audio cue which can be heard by enemies if they are not too far away. Opportunities for using Pathfinder’s Ultimate ability for the benefit of the entire team are hard to come by, so you should generally look to use it for personal and independent gain. It has a short enough cooldown that you should feel comfortable doing this. Finally, let’s finish up with some more general tips and tricks on winning Apex Legends matches as Pathfinder. Look for flanks and aggressive repositions. This advice goes for Apex Legends in general, but particularly with Pathfinder you have so many options when it comes to mobility and unexpected repositionings that you really do need to take advantage of it at every opportunity. Concentrate on mobility to make up for Pathfinder’s large hitbox. Pathfinder is not the most difficult character in the world to land shots on, so your main defence is to grapple, swing, slide, jump, and move as much as you can during fights. Take advantage of those abilities. Don’t be afraid to be ahead of your teammates. Being ahead of your teammates as Pathfinder is inevitable, and as long as you don’t overdo it, this is how he should be played. Really, Pathfinder should be classed as a Recon Legend alongside Bloodhound, because his place is always at the front, scouting ahead, planning out the movements and rotations of the team as a whole. So don’t be afraid of putting some distance between yourself and your teammates. And that’s pretty much it for Pathfinder; hopefully you’ve emerged a little more enlightened as to just how much he can do if you master his admittedly fairly complex abilities. Just remember to be bold with your plays, and to have fun, because that’s what Pathfinder really excels at more than any other Legend. Because when you get it right with Pathfinder, you get it so right.